Usually a fount of information regarding the history and symbolism of Army insignias and seals, The Institute of Heraldry remarkably has no information regarding how the 2nd Infantry Division came to have its distinct “Indianhead” unit patch, officially referred to as a Shoulder Sleeve Insignia. Fortunately, the story can be found on the Web site of the 2nd Infantry Division Association (21DA), a non-profit and non-partisan organization for present and former members of the division dedicated to honoring the unit’s storied achievements and sacrifices in our nation’s defense. According to 2IDA, the man ultimately responsible for the adoption of the Indian-head design was Lieutenant Colonel William Herringshaw. While training with French forces in the winter of 1917-1918, Herringshaw noted that the French trucks were adorned with unit symbols and was inspired to come up with a symbol for the division, which had been organized in France on 26 October 1917. 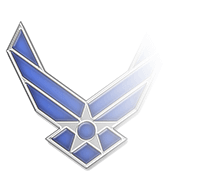 Herringshaw decided to sponsor a contest in which men from the division would submit ideas for the insignia. As the 2IDA version tells the story, Herringshaw selected three of the submissions: an Indian’s head, a white star, and a third whose design has long been forgotten. 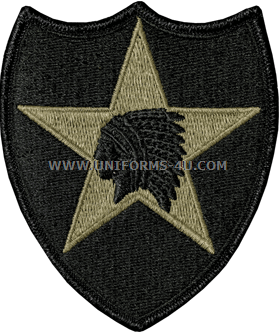 Not convinced by either of the two, he combined them by placing the Indian’s head on the star to come up with the basis of what ultimately was approved as the division’s official insignia. But 21DA isn’t the only source for the Indianhead legend. The online magazine NCO Journal tells a slightly different version, with only two “winning” submissions, both submitted by NCOs: Sergeant Louis Lundy came up with the Indian’s Head imagery, while Sergeant John Kenny was responsible for the plain white star. 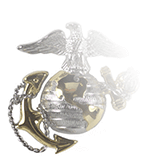 According to NCO Journal, the design of the insignia—the shape, colors, and background—varied depending on the type of unit a Soldier served in; this was the result of a decision by Major General John A. LeJeune, one of two Marine Corps Generals to command the division. 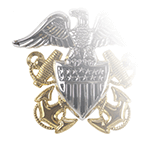 It wasn’t until 1933 that the current insignia was approved and authorized for wear. 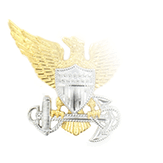 The eye-catching design led to the unit’s nickname as the “Indianhead” division, while its motto—“Second to None”—embodies the division’s commitment to excellence. 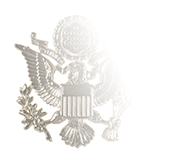 You can learn more about the 2nd Infantry Division’s history by checking out our pages devoted to its Combat Service Identification Badge and its Distinctive Unit Insignia, often referred to as a unit crest.